Former student at the French Institute of Political studies known as “SciencesPo” and at the National School of public administration called ENA, Hubert Védrine served successively as a diplomatic advisor, spokesman and Secretary-General (chief of staff) under the presidency of François Mitterrand, from 1981 to 1995. 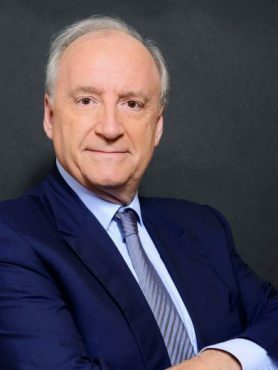 In January 2003, Hubert Védrine founded “HUBERT VEDRINE CONSEIL”, a public consulting firm specializing in foreign, economic and geopolitical affairs. He has chaired the François Mitterrand Institute since 2003. He was chosen by Kofi Anan to be one the twenty international members of the High Level Group of the “Alliance of Civilizations” in 2005 and 2006. « Dialogue avec Dominique Moisi – Les cartes de la France à l’heure de la mondialisation » (Fayard, 2000). « Continuer l’Histoire » – en collaboration avec Adrien Abécassis et Mohamed Bouabdallah, Fayard, 2007.